It's been a few months since I last reported on how the Spring TMS device is doing with my migraine management, so it's time for an update. At this point, I can not only give you an update on my migraine management, but I can also report the results of submitting my receipt for the rental of the Spring to my medical insurance company. For those of you who haven't read my previous posts and aren't familiar with the Spring TMS device, I'll give you a brief overview of the device, and you'll be able to find relevant links at the end of this piece. The Spring is a portable device that delivers a single magnetic pulse to the back of the head (sTMS). It's FDA-approved for the acute treatment of migraine with aura, but it's also being used off-label for the acute treatment of migraine without aura and for migraine prevention. When a migraine is in progress, the magnetic pulse is intended to disrupt cortical spreading depression (a wave of irregular electrical activity that sweeps the brain when a migraine trigger is encountered, leading to the migraine attack and its symptoms) thus aborting the migraine and stopping the symptoms. When used twice a day for prevention, the magnetic pulses are intended to keep cortical spreading depression from starting, even when we encounter migraine triggers. At the first sign of a migraine, I administer three pulses from the Spring, wait 15 minutes, then administer three more pulses. If there is no improvement after 30 minutes, I repeat the step above. At the end of another 30 minutes, what I do depends on what stage of the migraine I'm in. If it's prodrome, I may repeat the pulses with the Spring or wait. If it's the aura or headache phases, I move on to my oral medications. Every day, I administer three pulses from the Spring twice a day. To me it makes sense to keep them around the same time every day, so I use it at noon and before going to bed. 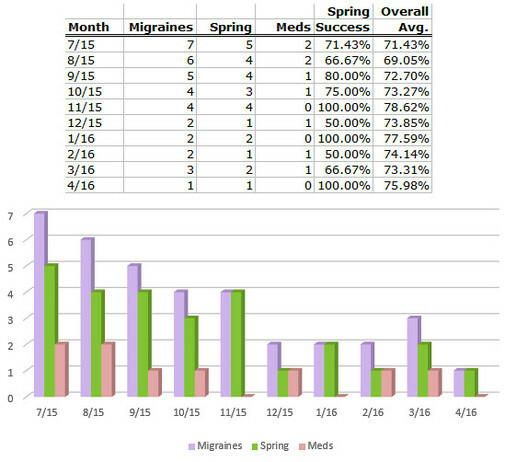 The chart below shows, for each month, how many migraines I had, how many were successfully aborted by the Spring, how many required a triptan and/or other medications, and the percentages for Spring success. As you can see, the Spring continues to abort most of my migraines - both migraine with aura and migraine without aura - without my having to take medications. This is especially important to me because I'm a heart attack survivor. Technically, triptans are contraindicated for me because of that. However, when I get a migraine, my blood pressure shoots up into stroke range and stays there until the migraine ends. Before I had access to the Spring, that meant every migraine left me with a difficult decision to make. Which is riskier - my blood pressure being in stroke range for hours or taking a dose of a triptan? I've felt the triptan was safer and have been using Axert. It's absolutely wonderful to not have to make that decision most of the time now. When I started using the Spring, I was getting six or seven migraines a month. In recent months, I've been getting two migraines a month. Last month, I had just one migraine, a fact that hadn't really struck me until I reviewed my migraine diary to write this post. I've been getting Botox treatments for chronic migraine every 12 weeks for a few years now. That's the standard, and my insurance company won't pay for the treatments any closer together. One problem with Botox has been that it seemed to wear off at about 10 weeks, at which point I'd see an increase in migraines until after my next treatment. Dr. Watson and I noticed that the Botox hasn't been wearing off at 10 weeks since I started using the Spring, so we've been extending the time between treatments. The last one was at 16 weeks, with no increase in migraines. We've scheduled my next appointment at 20 weeks. If there's no spike in my migraines from the Botox wearing off, we'll do a standard follow-up appointment that day, but discontinue the Botox. The introduction of newly approved devices is a bit more complicated than the introduction of newly approved medications. There are more questions about availability, cost and insurance coverage that can take some time to sort out and settle into place. At this point, these issues surrounding the Spring have stabilized. Availability: For a time, the Spring could be prescribed only by doctors at enrolled academic headache centers. This was because eNeura, the developer and manufacturer, is a small company, and they needed time to increase production. This is no longer the case. If a migraine and headache specialists wants to be able to prescribe the Spring, eNeura will send a staff member to train train them in the use of the Spring and leave fully operational demonstration units in their offices. There are now many more Spring prescribers/providers across the U.S. If you want to see which doctors near you can prescribe the Spring TMS, you can email eNeura (the company that makes the device). Doctors who are interested in prescribing the device can also email that address. Your doctor sends a three-month prescription for the Spring TMS to eNeura. eNeura prepares your device and ships it to your home. You are billed $250 per month for the use of the device, three months at a time. When the device is first prepared and shipped, there is a one-time charge of $50.00. Total charges for the first three-month period come to $800.00. Near the end of the three-month period, your doctor can renew the prescription. eNeura then mails a small data card to replace the original data card in the machine. If the prescription is not renewed and the new data card inserted in the Spring TMS unit, it stops working. eNeura instructs everyone to keep the original packaging. If a patient stops using the device, it needs to be shipped back to eNeura. Insurance Coverage: eNeura does not bill insurance companies, but we can submit our invoice for reimbursement. My medical insurance coverage changed to a new company on January 1. I'm thrilled to be able to tell you that they approved my claim for reimbursement the first time I submitted it, reimbursing at 60%, which comes to $450 of the $750 three-month charge. ** A note on this**: I wanted to cover all of my bases so my claim would be processed quickly, with no or few questions. I submitted the insurance company's claim form, a copy of the eNeura invoice, my receipt for payment, and a letter of medical necessity from my doctor. When I first heard about the Spring TMS device, it was still in development. Since it wouldn't present the danger that triptans present for me, I was excited about it and impatient for it to hit the market. That was almost five years ago. When I discovered I could get the Spring last summer, I was happy to be able to try it, but I also knew it might not work for me. Nothing works for everyone. Still, the way the Spring works is logical and made great sense to me. Not only has the Spring worked for me, it's actually exceeded my wildest hopes for it because it's not only working well acutely, it's working wonderfully well preventively too. That's something I hadn't really thought about when I started using it, but I'll take it! At first impression, the using the Spring may seem expensive. To me, it's not. If my insurance company didn't cover it, my husband and I would find a way to work it into our budget because aborting migraines without medications and reducing the number of migraines I get is that important to us. It's also saving us money on other treatments. I haven't refilled my Axert prescription for six months, so we're saving that co-payment. We've also been paying $1,800 per year in co-payments for Botox treatments. If things go as well as they have been, we'll no longer have that expense. The bottom line here is that, after 10 months using the Spring TMS device, I can report that it's working very well for me, both acutely and preventively. Will this success last forever? I don't know. Certainly successful treatment with medications hasn't. Treatment regimens have worked well for me for quite some time, then lost their effectiveness. Given how the Spring works, that may not be an issue with it. Time will tell. For now, I'm not going to worry about that. I'm going to be grateful to have effective treatment that gives me no side effects and is a safer option for me than the acute treatment I was using. Press Release. "eNeura receives CE Mark label extension expanding use of SpringTMS to include migraine prevention." PHARMABIZ.com. Baltimore, Maryland. April 23, 2016.